‘Engineers!…We want your demands to be more exacting, and more deep the principles you struggle for. Fight with your brothers of other industries for these bigger and nobler things as earnestly and solidly as you recently fought. Fight politically as well as industrially, then, with the principle of the class struggle to guide your fighting’ (Socialist Standard, June 1917). 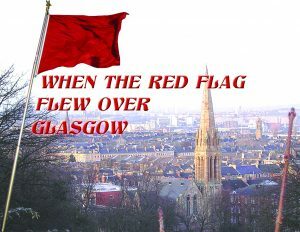 The story of Red Clydeside is one of disappointment in that there was no ‘revolutionary’ movement. Willie Gallagher observed in his memoir, Revolt on the Clyde: ‘A rising was expected. A rising should have taken place. The workers were ready to effect it; the leadership had never thought of it.’ There is little evidence that any such revolt was expected. The Clyde Workers Committee (CWC), an informal network of shop stewards, was formed in 1915 to defend workers’ interests, further their industrial demands, and for some of them, to oppose the war. Under pressure from the CWC, a general strike in pursuit of a 40-hour working week was called for 27 January, 1919. It led to ‘Bloody Friday’, when strikers clashed with police in George Square on 31 January amid ‘unprecedented scenes of violence and bloodshed’ as the Glasgow Herald put it. Myths circulate and re-circulate, and new ‘facts’ add to the mix. The troops and tanks in George Square, Glasgow is an example of imaginary incidents. A riot happened. There is no doubt about that but it was a police riot, who launched a violent attack on the strikers. The police had anticipated that their baton charge would drive the crowd out of the square – not so. Not only did the strikers and their supporters stand their ground but drove the police back. There was a re-grouping and the workers marched to Glasgow Green. When they reached the Green the police were waiting, ready to charge again. Undaunted the strikers pulled up the park railings and chased off their attackers. For the rest of the day and into the night, sporadic fighting took place throughout the city. There are lots of myths, including that the government used tanks against protestors but they didn’t. 10,000 men and six tanks were dispatched to Glasgow, arriving after the rioting was over. No-one was shot, beaten up or forced back to work by the army. No rioters faced troops with fixed bayonets and there were no tanks in George Square. For years a photograph of a tank making its way through crowds at Glasgow’s Trongate was wrongly identified as dating from January 1919 but the picture was taken in 1918 during a campaign to promote war bonds. The ‘all the troops were English’ myth can be dismissed as the press at the time listed and photographed men from Scottish regiments such as the Seaforths and the Gordon Highlanders plus the 1,600 men from two English regiments (one of them based, in 1919, at Bridge of Allan, near Stirling, the other in Co Durham). Glaswegian troops at Maryhill, however, were confined to barracks as a precautionary measure. The soldiers stood guard at railway stations, tram depots, power plants and gas-works, and, with the still fresh memory of the GPO in Dublin’s Easter Rising, the city’s main post office. The other exaggeration was the revolutionary nature of Clydeside’s Independent Labour Party (ILP). This was a reformist left-wing party whose vast majority of leaders were far from Bolshevik revolutionaries. The ILP in 1922 returned several MPs, among them James Maxton, David Kirkwood, John Wheatley, Thomas Johnston, John McGovern and Shinwell. They were sent to Westminster in a wave of left-wing enthusiasm. Clydeside was far more revolutionary in hindsight than it ever was in reality. Iain McLean in The Legend of the Red Clydeside asserted that what took place was neither a revolution nor ‘a class movement; it was an interest-group movement’, engineers defending their skilled status and their pay differentials.